Jerry West played his entire professional career for the Los Angeles Lakers. His nicknames include "Mr. Clutch" for his ability to make a big play in a clutch situation; "The Logo" in reference to his silhouette being incorporated into the NBA logo; and "Zeke from Cabin Creek" after the creek near his birthplace of Chelyan, West Virginia. He was voted 12 times into the All-NBA First and Second Teams, was elected into the NBA All-Star Team 14 times, and was chosen as the Most Valuable Player of the All-Star game in 1972, the same year that he won his single NBA championship ring. 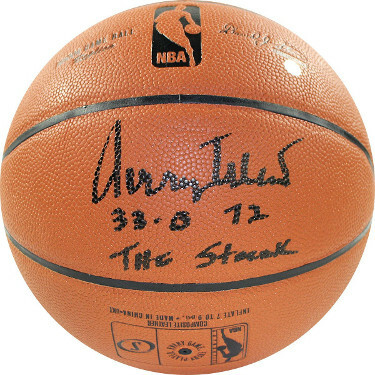 Jerry West has hand signed this Spalding NBA Indoor/Outdoor Basketball with 32-0, 72, The Streak inscription. Steiner Sports Hologram and Certificate of Authenticity.